of the finest incense in the world. Our specialties are Japanese and Tibetan incenses. We also carry a range of incense holders, Tibetan handmade paper products and a selection of the writings of the spiritual master Sri Chinmoy. We currently wholesale all our products to stores throughout Australia and New Zealand. An invigorating blend of sandalwood, patchouli, cinnamon, and benzoin. A smokeless incense with the soft, sweet aroma of Chrysanthemum flowers. A book of aphorisms for joy and inspiration. 60 sticks, approx 30 min burning time. Sweet, deep & mysterious. Ideal for meditation & quiet reflection. 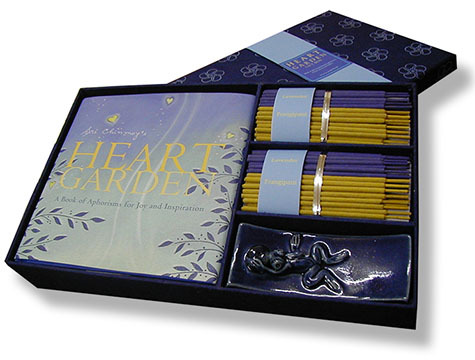 Sixty 100% Natural Lavender Incense Sticks & Ceramic Holder. Burning time: 15 minutes per stick. © Copyright 2018 Incense of the World, Australia. All rights reserved.